IMPORTANT – The Club has now acquired an Automatic External Defibrillator for the benefit of members, visitors and local neighbours. It is situated on the wall in the social area next to the indoor green and is ready for immediate use. County Sucess: 2 of our members made it to Couinty finals for the 2017-2018 Indoor Season - Bob Milligan in the Mens Singles and Bob Milligan and Phil Birmingham in the Mens Pairs. 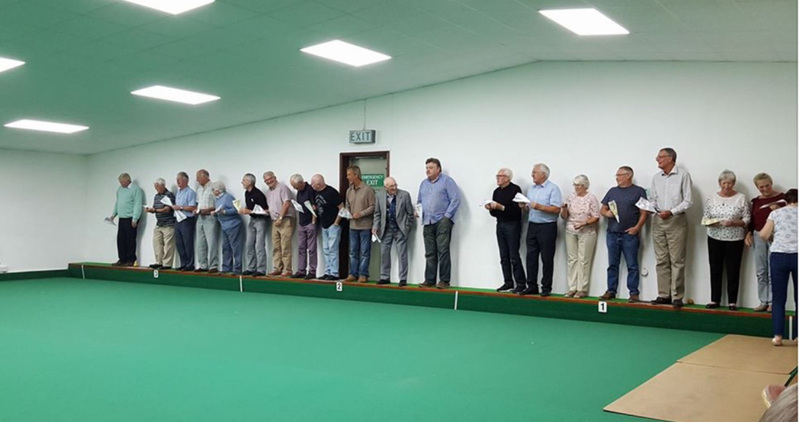 Both finals took place on 21st April 2018 at the Bedford Borough Bowls Club and 12 Club members attended to support. Unfortunately both finals were lost despite very valient efforts by our members. This was the first time for a number of years that Bridgmans has been represented in county finals and we applaud ther sucess of both Bob and Phil. Lets hope they can go one better next year! The Outdoor Season Is now well underway. Please support your Club by putting your name down for Friendly matches - here is a to the Match fixtures - please put the dates in your diaries now! - and on the Match Sheets as soon as they are put up. A Summer social and Fish and Chip Supper was held on Friday 7th September. The evening included a Quiz and a Paper Aeroplane competition (see photograph below). 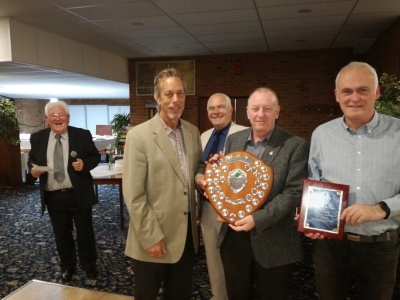 Also the Club President, Norman Kitchener, presented the trophies for the Indoor Leagues during the 2016/17 season. The presntation for both the 2016 and 2017 Outdoor Leagues took place at Kempston Park Bowls Club (formerly Lawson Park). Bridgmans was represented by 9 Club Members. The Bridgman A Team received the League 3 Winners Trophy for 2016 and the League 2 Runners up Trophy for 2017. The Bridgman B Team received the League 4 Runners up Trophy for 2016 and the League 3 Winners Trophy for 2017. 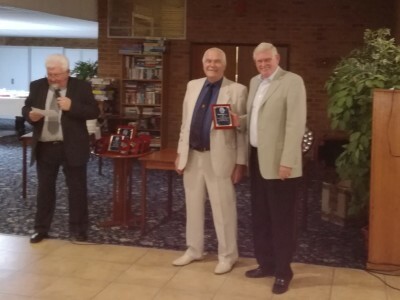 These were all presented by Paul Wilkinson, the Bedford Bowls League President for both 2016 and 2017. Left: Norman Kitchener receives the League 3 Winners Trophy for 2016 and then tries to persuade Paul Wilkinson not to take it back! League 3 Winners Tropphy for 2017. For more information on Social and other events please keep your eyes on the Notice Boards in the Club House. Members will also receive email notification.